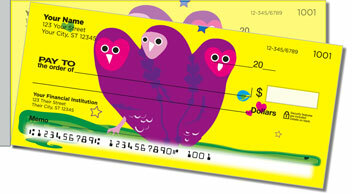 You'll get a real hoot out of this set of whimsical owl checks from CheckAdvantage! But these night owls look wide awake in broad daylight-what's up with that? Oh, of course-this is an artist's fantasy, where barn owls dance on rainbows and free-floating flowers and stars fill the daytime sky! 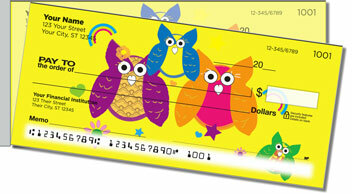 Order your very own Colorful Owl Side Tear Checks to build a nest of fun in your purse or pocketbook! 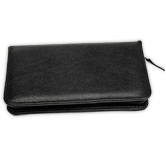 They're not only cute as can be, they're a terrific value, too, thanks to their short line of perforation on the left. With the improved leverage it affords, you can separate finished documents quickly and cleanly from the pad, which means fewer accidental rips and therefore, fewer voided checks. 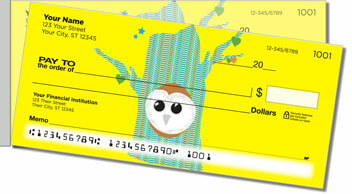 Make Colorful Owl Side Tear Checks yours today! 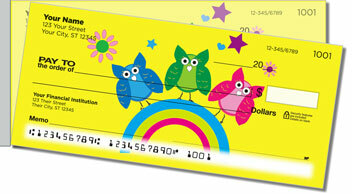 These bright and cheerful cartoon owls are also available as a set of address labels. Complete your order now!